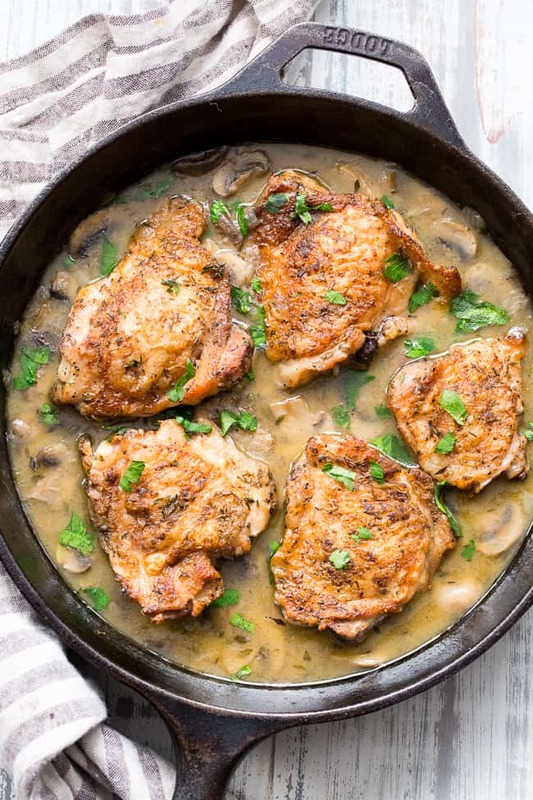 This crispy paleo chicken with creamy mushroom sauce is made all in one skillet, packed with flavor, dairy free, paleo, keto and Whole30 compliant! Seasoned crispy skinned chicken thighs with a dairy free mushroom sauce that’s perfect over cauliflower rice or with roasted and veggies. 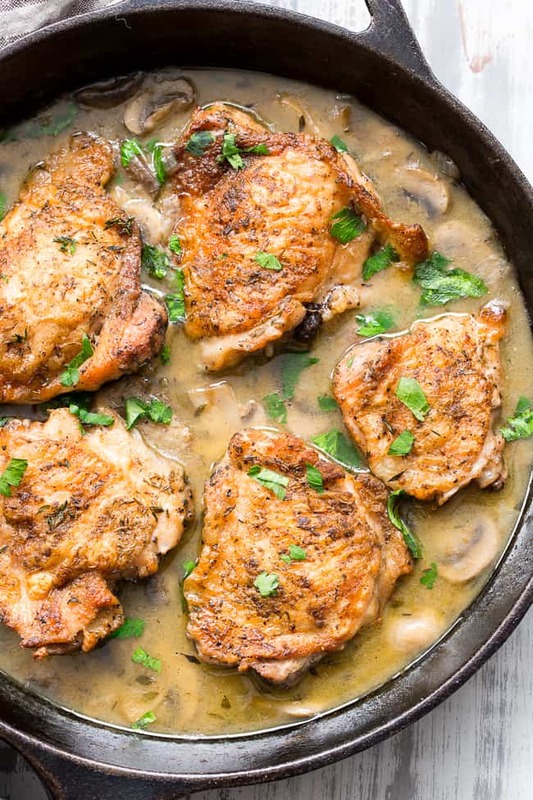 Crispy seasoned chicken and creamy mushroom sauce – yes – it’s totally possible while doing the Whole30! When I first started paleo, I honestly had no idea how to make this sort of meal work out. When I thought of chicken, I pictured it sitting next to a few boring steamed veggies and felt, well, bored. And completely uninspired to actually eat! It took me awhile, but, I’ve since figured out how to make paleo and Whole30 compliant, dairy free sauces that are creamy and flavorful just like (or almost like!) those traditional sauces containing heavy cream and cheese. Second, don’t be afraid to thicken your sauces with tapioca or arrowroot flour. These flours (along with almond and coconut) are Whole30 compliant for dredging and thickening, though not for baking or trying to replicate dessert. It takes a bit of practice to work with these thickeners to get the right texture for your sauces, but the results are very satisfying! This mushroom sauce only needed a bit of arrowroot starch to thicken it enough for my tastes. Third, a little bit of Whole30 compliant mustard goes a long way for flavor (and helps to mask the coconut too!) I use mustard in nearly all of my dairy-free sauce recipes and it never disappoints! And on the subject of flavor, organic ghee (clarified butter) adds great flavor to gravies and sauces as well. 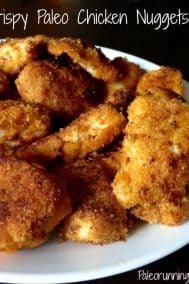 Moving away from the sauce, let’s talk about the actual chicken now! I tend to lean toward boneless skinless chicken thighs for many recipes, since they cook quickly, get crispy, and don’t dry out. For this one though, I was craving the seasoned crispy chicken skin that you can only get with, well, skin-on chicken! It does make the recipe a bit more time consuming, so if you know you’ll be short on time to cook, subbing with boneless chicken thighs is fine. They won’t be as crispy but they’ll bake for less time, and still have tons of flavor and juiciness. The recipe itself is very straightforward, and everything is cooked in one skillet for less cleaning up afterwards (YES!) The chicken is seasoned, browned in ghee, then set aside while you cook the onions, mushrooms and garlic. 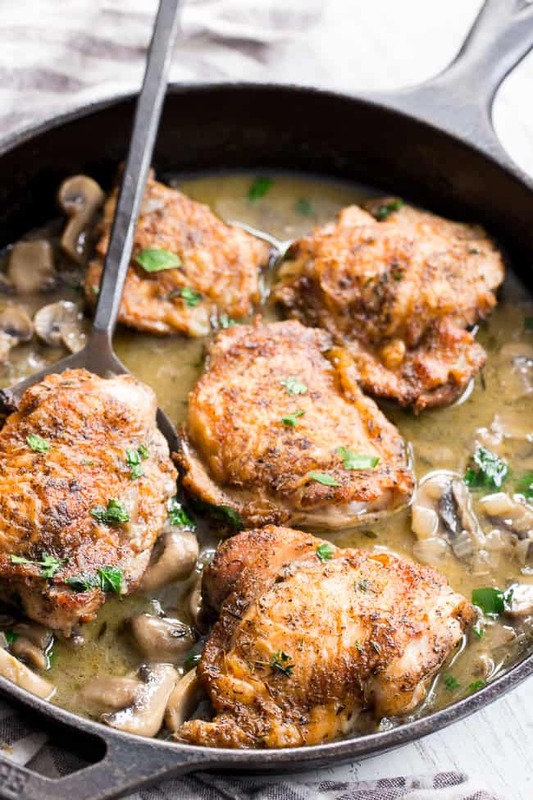 The chicken then bakes with the mushroom mixture and broth until done, then you make the sauce on the stovetop right in the skillet (it’s quick!) before serving everything together. To keep it low carb and keto, you can serve it with a green salad or over cauliflower rice, roasted brussels sprouts or your favorite cooked greens. If carbs aren’t an issue, it’s also delicious with a side of roasted potatoes or sweet potatoes! I hope you’re ready to cook (and eat!) – let’s go! 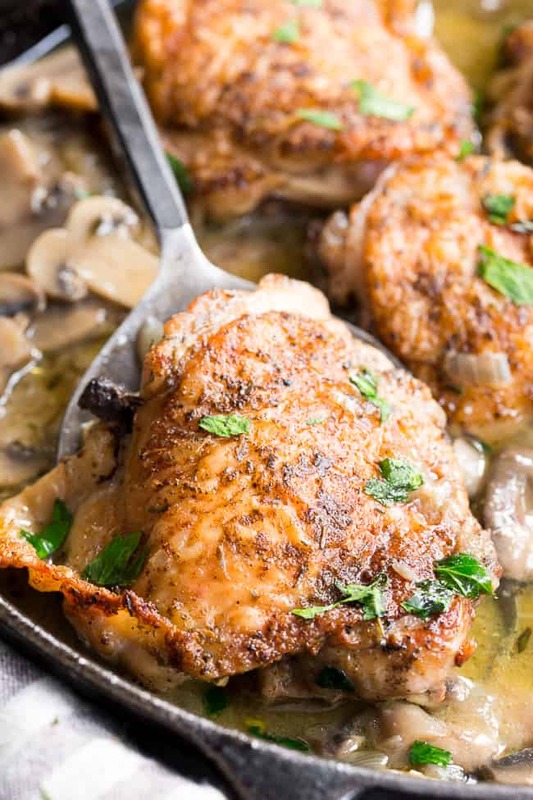 This crispy paleo chicken with creamy mushroom sauce is made all in one pan, packed with flavor, dairy free, paleo, keto and Whole30 compliant! Seasoned crispy skinned chicken thighs with a dairy free mushroom sauce that's perfect over cauliflower rice or with roasted and veggies. Heat a large cast iron skillet (or any oven proof skillet) over med-high heat. Season chicken with salt, pepper, sage, and thyme, rubbing in seasonings to coat skin. Add 2 Tbsp ghee to skillet, then brown chicken in skillet on both sides - about 2-3 minutes per side. Once browned, remove chicken from skillet to a plate and lower heat to medium, add 1 more tbsp ghee to melt. Add onions and cook one minute until softened, then add mushrooms and garlic and continue to cook 3 minutes over med heat until softened. Season with salt and pepper to taste, stir in broth, and remove from heat. 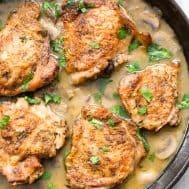 Return chicken and any juices back to skillet, place skillet in preheated oven and bake 25 minutes, until cooked through, return skillet to stovetop. Remove just the chicken from skillet with tongs to make the sauce. Whisk tapioca and mustard into coconut milk, then add to skillet and whisk to combine. Bring to a boil and allow to boil 2-3 minutes until thickened, stirring. 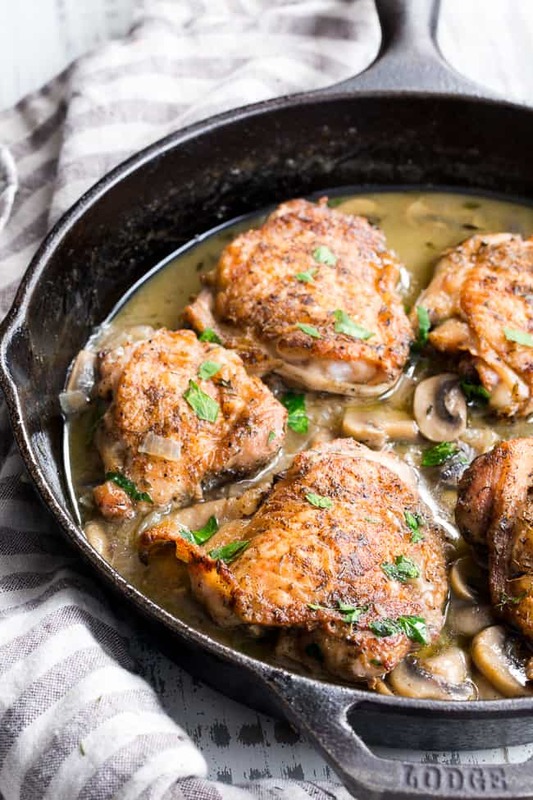 Return chicken to skillet and serve with mushroom sauce. Enjoy! Serves 5-6.
i love mushrooms but my kids will not eat them…could i eliminate them from this recipe and still get a flavorful sauce? This was DELICIOUS!! Thank you for such great recipes! So many recipes call for coconut milk and my husband is allergic to all things coconut. Do you have a suggestion for substitution? You can try Whole30 compliant almond milk (no sugar and carrageenan) although it won’t be as creamy, so you’ll get a thinner sauce. This was easy to make & delicious! I loved the sauce ? Thank you for the great recipe. I will definitely make this again. I made this for my family last for dinner, along with Brussels sprouts and quinoa. Two out of three kids, 10 and 8, asked for seconds and my husband said, “this is one of the best meals you ever made!” He loved the chicken and sauce. He put it on everything on his plate. Delicious!! Definitely going to make it again and again. That makes me so happy to hear! When the kids and hubby love it you know it’s a keeper – thrilled you guys liked it! I think gelatin would be too lumpy and I’m not sure how the xanthan gun would work as a thickener. 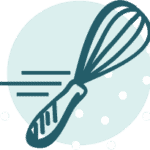 I’ve used xanthan gum as a thickener before in other recipes. Wasn’t sure how much to use so I went light. I used just a half teaspoon and that worked great. A little goes a long way. Sauce thickened nicely. So if anyone else wonders you can use xanthan gum, but a tiny bit is all you need. Thanks for the recipe. It was delicious. This was delicate and my husband loved also. I will be sharing it with friends. That’s great! So happy to hear you guys liked it! This was fabulous! Easy to make. It is Restaurant Week in KC and after we eat this dish, my husband stated we wouldn’t find anything better out in KC and though we only hit two restaurants, he was right! This is an exceptional dish. Oh my gosh, this was fantastic. I loved the creamy sauce. This recipe was easy to make! I made this last night and I will keep this recipe on hand. It had amazing flavor. I did a side of roasted green beans and garlic.. My boyfriend loved it! thank you for your flavorful and healthy recipes! Sounds great! Happy you enjoyed! Made this for dinner tonight and it was AMAZING! I have a hard time getting a lot of my paleo sauces to actually be thick but this was perfect! Thanks so much! This dish was delicious! 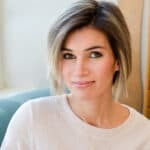 I have been struggling to come up with healthy meals to cook for myself and my boyfriend, and started following you on Instagram after seeing that one of my friends (who is always posting healthy meals) follows you too. I found this post after an Instagram story you posted last night and made it tonight for dinner. I tend to stay away from recipes that have too many ingredients or look too complicated to make because I am not great at cooking, but this was perfect for me and it came out great! My boyfriend went back for seconds so I knew he genuinely liked it and wasn’t just trying to make me feel good. 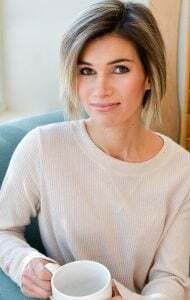 Additionally, I try to eat non-processed foods whenever I can to follow an anti-inflammatory diet (thanks to a condition I have) and I am so grateful that I came across your blog with all of your paleo and whole 30 recipes. I will definitely be back for more! This was such a satisfying meal! We made it with the mashed potatoes from the Swedish Meatballs post – so good. 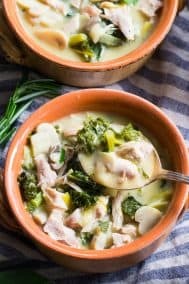 I didn’t even have a thickener so we skipped it and it was more like a broth/sauce than gravy – still so good and can’t wait to try it the right way! This was delicious. We made it with chicken breast and used the coconut milk. Thank you for sharing. It was easy and tasty. The sage really gives it a unique flavor ( a little flare on chicken masala). 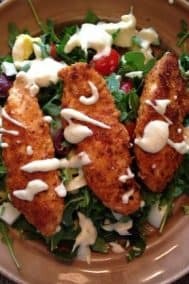 Another great recipe from Paleo Running Momma. She never disappoints. Easy to make, tastes great, and it’s healthy!